The popular PAL (Portable Aquatic Lift) has become the industry standard for providing access to swimming pools! 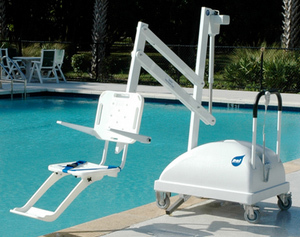 It is a portable, free-standing pool lift that comes with the PAL Secure-It Kit so that it can be fixed to the deck. The PAL Lift series meets the Americans with Disabilities Act Access Guidelines (ADAAG 2010). In addition to the standard configuration, the PAL lift is also available in Hi/Lo and Spa versions. 240° rotation ensures a safe transfer area. 300 pound lifting capacity. Powered by a 24-volt rechargeable battery. Powder coated stainless steel and aluminum.